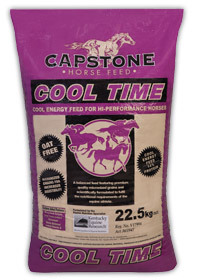 Capstone Cool Time is a muesli style cool high energy oat-free feed ideally suited for hi-performance horses that tend to tie up, are excitable or sweat heavily. It is a balanced complete feed, featuring premium quality micronized grains, scientifically formulated to fulfil the nutritional requirements of the equine athelte. Contains micronized cereal grains: A patented, relatively new processing technology that increases small intestinal digestibility of grains and reduces the risk of starch overload of the caecum or large intestine. Live Yeast culture: Increases hindgut digestion of fibre. Oat free & high Barley content: For cool energy and tractable behaviour in horses. 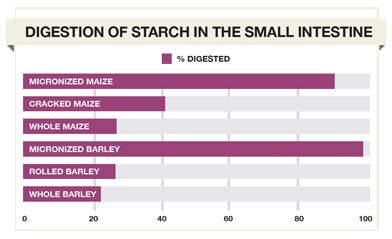 Very high in fat: Cool high energy source that reduces the risk of starch overload of the hindgut. Fat also promotes coat shine. Includes Lupins: Lupins provide a cool source of digestible energy – high in protein and digestible fibre, but low in starch. High Magnesium levels: Calms nervous horses. Fully fortified: Meets all the protein, vitamin and mineral requirements of the hi-performance equine athlete. Added antioxidants: Vitamin E and Selenium can reduce muscle soreness, cell damage and other related disorders. Added Chromium: To improve Glucose transfer and reduce lactic acid accumulation. Added Electrolytes: To replace electrolyte losses in sweat during exercise and travel. Muesli style feed: Appealing and highly palatable ensuring that horses “clean up”. You can see what you are feeding. High levels of B Vitamins: To help build red blood cells and keeps horses “cleaning up” feed. Reduces risk factors for Tying Up: Suitable for horses prone to tying up. Added Beet Pulp: A highly digestible source of super fibre. Unprocessed grains let significant amounts of undigested starches pass through the large intestine or hindgut, where they ferment, resulting in lactic acid, gas, heat and ammonia build-up, leading to a lower hindgut pH. As a result, horses could suffer from acidosis, fatigue, nervous behaviour, colic, laminitis, gastro intestinal upsets and reduced performance. Horses in full exercise weighing approximately 500kg, will require between 4kg (or 7.5 litres) to 8kg (or 15 litres) of Capstone Cool Time per day, depending on the amount and intensity of exercise. Halve the intake of Capstone Cool Time on rest days. Capstone Cool Time should be fed in conjunction with a minimum of 1% of the horse’s bodyweight (5kg for a 500kg horse) of good quality roughage such as chaff or hay to provide a fibre source for optimal hindgut health. It is recommended not to feed more than 2.5kg (or 5 litres) of Capstone Cool Time per single feed. Because Capstone Cool Time is a highly digestible, high energy feed, care should be taken not to overfeed horses confined to stables or not receiving regular exercise. Capstone Cool Time is suitable for performance horses that tie up due to its low starch, high fat and oat-free formulation. Reduce the intake of Capstone Cool Time if horses gain too much weight or training intensity decreases. Introduce Capstone Cool Time to your horse’s diet gradually over a period of 4 to 7 days. During periods of heavy sweat loss, additional supplementation of a good quality electrolyte, such as Capstone Horse Electrolyte, is recommended. Micronized Maize, Micronized Barley, Lupins, Canola Oil, Canola Meal, Soya, Sunflower Seeds, Sunflower Meal, Lucerne, Wheaten Bran, Beet Pulp, Molasses, Salt, Feed Lime, Di Calphos, Chromium, Magnesium, Vitamin E, Vitamin & Mineral Premix, Live Yeast, Lysine. Store in a cool, dry place (below 25°C) away from direct sunlight with good air flow.